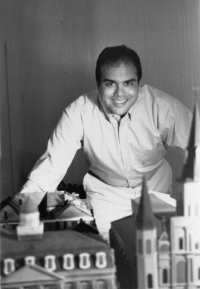 Born and raised in Brooklyn, New York, Richard Campanella studied at Utah State University and earned his B.S. in economics in 1988. After several summers as a wilderness ranger for the U.S. Forest Service, he joined the U.S. Peace Corps and served in Honduras for the next two years. Upon completing his service, he moved to Washington, D.C., where he worked as both an economic analyst and an English teacher. He completed his graduate studies in geography and mapping sciences at Louisiana State University in Baton Rouge and, upon receipt of his master's degree, began working at Stennis Space Center in Mississippi. In 1993, Mr. Campanella married his wife, Marina Lopez de Campanella. Born in the village of San Juan Trujano in Oaxaca, Mexico, she studied to be a schoolteacher in Mexico City until 1989, when she came to the United States. When she and her husband moved to Mississippi, she worked in childcare, studying special education at Mississippi Gulf Coast Community College in Biloxi. Together, the couple moved to New Orleans and wrote New Orleans Then and Now, which was selected by the New Orleans Times-Picayune as one of the best local books of 1999. 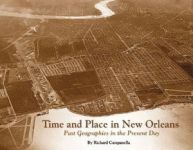 Mr. Campanella's solo venture, Time and Place in New Orleans: Past Geographies in the Present Day, explores the influence of New Orleans' unique geography on the city's growth and development. 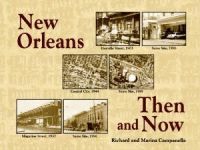 Named the best local book of 2002 by the New Orleans Gulf-South Booksellers Association, this illustrated large-format history book proves that the city is defined by its location. Currently the assistant director of environmental analysis at the Center for Bioenvironmental Research at Tulane and Xavier Universities, Mr. Campanella resides in New Orleans, Louisiana, with his wife. Nearly 400 side-by-side photographs (many never before published) dating from 1847 to the present compare views as captured from the street, roof, and air in this visual exploration of the Crescent City. Referred to by some as the City That Care Forgot, New Orleans does, in fact, bear some scars caused by the ravages of time, nature, and “progress.” During the past 150 years, these afflictions have removed several estimable edifices from the cityscape. Hardcover. Time and Place in New Orleans proves that the city is indeed defined by its location. From the city’s problematic founding (the site was moved six times in twenty-three years) to its present reliance on century-old pumping stations, Richard Campanella explores the influence of New Orleans’ singular topography and geography on the city’s growth and development. Hardcover.